The Moscow Patriarchate is concerned that the administration of the European Union has taken an ultra-liberal stance on moral issues. 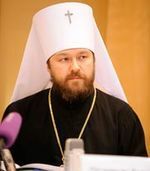 “Unfortunately, the administration of the European Union has recently taken anti-church and anti-Christian positions on some issues,” Metropolitan Hilarion of Volokolamsk, head of the Moscow Patriarchate Department for External Church Relations, told a briefing in Moscow on Friday. “These processes alarm us very much. The EU administration is forcing anti-Christian norms on all EU countries. Some countries manage to repel these attacks, and some can’t,” he said.